If you want to pause your music or video, you can hit the pause button on your Mac, or navigate to the app and turn it off with your mouse and keyboard. Then you have to do the same thing to start playing again. Flutter takes a different approach. Flutter’s creators basically said they got tired of controlling their media with a keyboard and mouse. 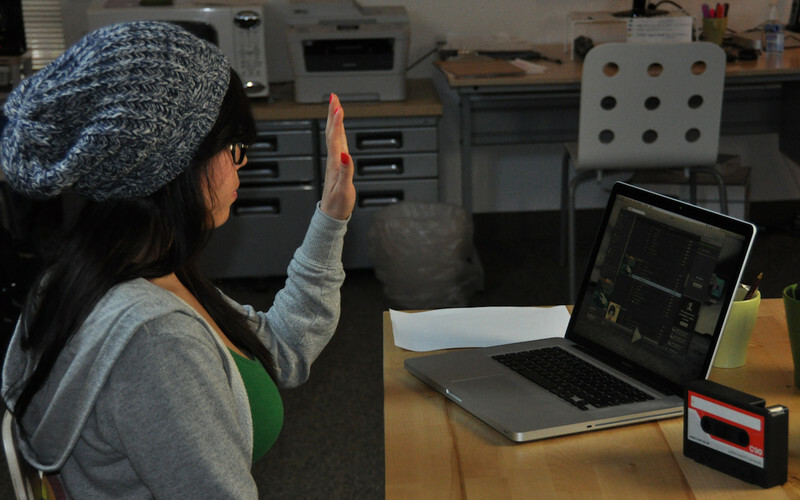 What better way to control your media than with gestures? Flutter uses your Mac’s webcam to allow you to control your music or video playback. While your media is playing and Flutter is running, just raise your hand in front of the camera. This can be done any where from a foot to about 6 feet from your Mac. It worked surprisingly well even up to about 5 1/2 feet (about 1.67 meters), but beyond that it became rather irregular in response. I found the optimal distances to be between 1.5 and 3 feet. The app has a fairly good horizontal angle for gestures at about a little over 30 degrees. Vertical angles were not as responsive, but being slightly above the camera was better than being slightly below it. The app did a very good job at seeing the differences between an open palm and a fist, as well as other hand gestures. It took a minute to get used to where my hand needed to be at first, but pretty soon I got used to its angles and could gesture without having to look at my Mac. those apps at a time, and it will tell you in a notification which app it is controlling. When you switch media apps, Flutter will pop up the notification acknowledging the change. I do like this pop-up, but I wish it had a way to integrate with Growl instead and pop up with the rest of my notifications. You can set Flutter to turn on when you login, but Flutter also has the option to be running without the webcam active. This is a great setting to save battery life and not having to turn Flutter on manually every time I wanted to watch a movie or listen to a song. Flutter is not fully baked yet, as the app makers note it is in the early stages of development. The clearest example of this is that Flutter only supports one gesture: an open palm in front of the camera to pause or play your media. For this app to be better, it needs more gestures. I’m sure we can expect more gestures in the future, perhaps like raising or lowering of my hands to raise and lower the volume, or other gestures to rewind and fast forward songs. I commend also the starting lineup that Flutter supports; iTunes and QuickTime make sense, and Spotify and VLC (two very popular Mac media apps) are great additions. Hopefully we’ll see other media apps, like MPlayerX (my personal video player choice) will be added in the future, or even control of web videos like YouTube. On an aesthetic note, I’d like to see the Flutter app have an option for a black & white menubar icon rather than the colored option. Lastly, because the app uses your camera, your Mac will run hotter and use more of your battery while the camera is active. If you have any questions, comments, or suggestions about this or any other topic, leave a comment below or email me at easyosx@live.com You can also check me out on Facebook, Twitter, and YouTube by hitting the buttons on the top of your screen. And check out my Google Plus. Thanks! Hi there! I simply wish to offer you a big thumbs up for your great information you’ve got here on this post.